Is Vin Diesel a movie star outside of the Fast & Furious franchise? I would argue no. He's tried to keep his brand alive outside of Dominic Toretto with the Riddick series, but the 2013l entry only earned $98 million worldwide, which isn't bad considering the $38m budget, but certainly doesn't inspire a lot of confidence in folks being interested. Diesel can also now claim being part of the Marvel Cinematic Universe, but we all know his contributions are minor and so it is understandable Diesel wants to spread his wings. The guy at least seems to understand the type of movies his style and image are best suited for, but that doesn't mean The Last Witch Hunter looks like anything more than a generic piece of crap. Concerning itself with Kaulder (Diesel) who was once a member of an army of witch hunters before slaying the Queen Witch and being cursed with her immortality, this flick looks like something that should have been dropped in theaters in January or February. I won't jump to any conclusions as I rather enjoyed director Breck Eisner's last feature film, 2010's re-make of The Crazies, but I can't help but feel this will be of the generic action film variety. The inclusion of witches and priests and the yellow/black/silver color palette doesn't do much to inspire otherwise, but more signifies it wants to stick to a very obvious, predefined genre-a genre that doesn't tend to produce solid fantasy films. Who knows, Eisner could take a tip from Diesel's main franchise and embrace the ridiculous and turn this into something rather fun, but I don't have high hopes and I'm not even sure I care to see it. What do you guys think? 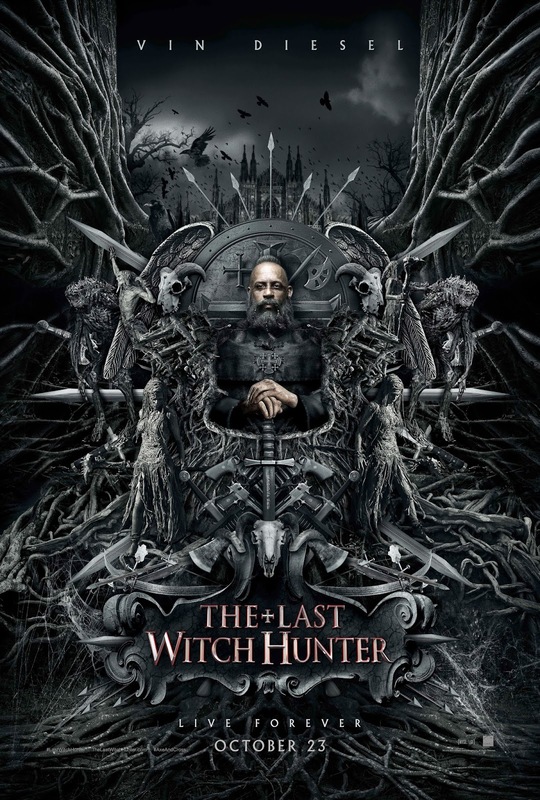 The Last Witch Hunter also stars Rose Leslie, Elijah Wood, Michael Caine, Ólafur Darri Ólafsson, Julie Engelbrecht and opens October 23rd. Synopsis: The modern world holds many secrets, but the most astounding secret of all is that witches still live amongst us; vicious supernatural creatures intent on unleashing the Black Death upon the world. Armies of witch hunters battled the unnatural enemy across the globe for centuries, including KAULDER, a valiant warrior who managed to slay the all-powerful QUEEN WITCH, decimating her followers in the process. In the moments right before her death, the QUEEN curses KAULDER with her own immortality, forever separating him from his beloved wife and daughter in the afterlife. Today KAULDER is the only one of his kind remaining, and has spent centuries hunting down rogue witches, all the while yearning for his long-lost loved ones. However, unbeknownst to KAULDER, the QUEEN WITCH is resurrected and seeks revenge on her killer causing an epic battle that will determine the survival of the human race.